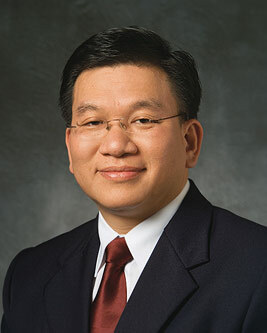 Michael John U. Teh is a General Authority of The Church of Jesus Christ of Latter-day Saints and was sustained a member of the First Quorum of the Seventy on March 31, 2007. He served previously as a member of the Third and Eighth Quorums of the Seventy in the Philippines Area. His church service also includes missionary, bishop, high councilor, stake president’s counselor, and mission president’s counselor. Teh earned his bachelor’s degree in business administration, majoring in management, from De La Salle University. He was working as the recorder of the Manila Philippines Temple at the time of his call to full-time Church service. He had also been the manager in Member and Statistical Records Division of the Church and a mail clerk in the Philippines Area office. He was born in Davao City, Davao Del Sur, Philippines on June 25, 1965, and lived in Manila from the age of twelve until his call to serve in the Philippines Davao Mission. He and his wife, Grace, are the parents of three children. This page was last edited on 27 August 2015, at 16:01.